ACID Pro 5, Loop Sequencer from Sony in the Acid series. I like Acid a lot but I wish they would add control surface support and same track recording. You can render and bounce to one track which helps but that will only take you so far. I hear they are adding these features in 6 however. Very easy to use. Easiest program on the market. I learned Acid before anything else on the market and I never read the manual until recently to see if I was missing out on any features. If you can play a cd player you can make classics with Acid. Its a Daw you get out what you put in. Have never had a issue with Acid quality wise and Ive been using it since 2001. I love Acid. It is one of my favorite programs on the market. l but frankly I think it's foutage Geul, must wait three years (the v4 was released in 2002) to have amliorations "logical" (rewire (not work well, like any sync with acid) compatibility VST etc ...), a lot of unnecessary Gadget (function "multi groove," media manager (which delayed the startup of the application which does nothing)) and the same problem of bug. 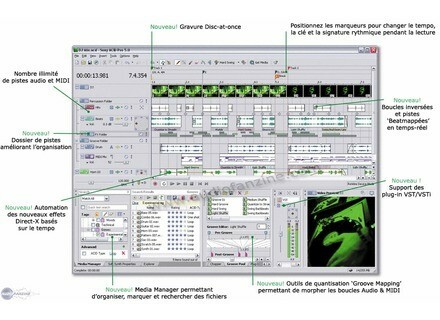 otherwise, we can still save multitrack (who said that an equivalent c'tait software cubase or protools ?????). in brief: APRS output live 4 this year, the new version is really bad acid! no incompatibility with two audio cards. always as easy to use. is due to zic and we quickly grabbed the Fast Fashion no ... prrglage and other multi windowing ...!!! no manual is franais.a vraimanrt a blme.car ACID is so thunderous, it does not take advantage of all its forces. I use it for four months. can take the call without this head. I use acid for 6 years. Periodic j'ssaie other softwares .. like Cubase, Logic, Sonar, Live, Reason ... nothing ... I return to acid despite its current version ... "buguquot; acid4 ". Trs full manual as always ... Previous virtually copied on, which is normal because one of the strengths of Acid is that innovations are "invisible" and that the interface remains the same since version 1 ... Never change a winning team. No problem running, no crash, except sometimes impossibility to start playing a song when I use ACID Ableton Live at the same time. C'tait apparently the driver of the asio Xstation who behaved badly with SP2, now I put days and it is impeccable. 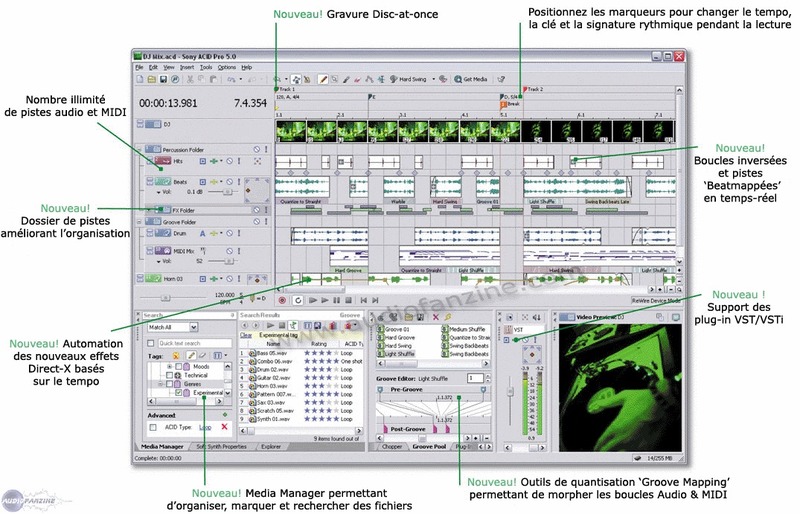 It's not a squenceur which compares Cubase, Sonar or Pro Tools, it is not for a, do not confuse everything. I use it for loop-based composing. And it is unbeatable! Rsultats own productivities lightning, incredible power functions of loops edition ... When connate keyboard shortcuts is a drug. With version 5, the MIDI is finally usable and VSTi compatibility has opened doors. Before c'tait dj happiness today is ecstasy. I use to compose and intensment ACID Ableton LIVE for scne ... My fantasy would be to make the transfer more ais a soft one. Although it is a soft sr a bit expensive but it's not a scandal. I bought my ds reu annona the mail the new version, and it again for version 6. I would do without this choice hsiter. Version 5 has really reassured with the acquisition by Sony, because I feared the worst about other products I found that this brand could really make fun of the mouth of the consumer. But for now my fears were unfounded t. Version 5 includes dozens of small amliorations, not a big rvolution but ACID is a mature soft for a long time, you should not expect a total change. We could all rl.